Lazy M Mountain Cabin offers our Montana retreat, proof that you can still get away from it all, nestled in the majestic terrain of the Gallatin National Forest! While the breathtaking beauty of our 5.7-acre setting will entice you to spend your hours relaxing on the porch, you won't want to miss out on the local hot spots. Towering pines, firs and spruce shelter our log cabin from the elements while providing the perfect setting for year round enjoyment. 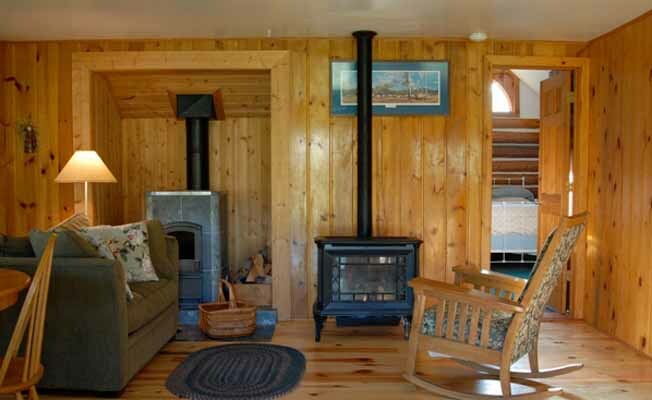 Updated and furnished to enhance your stay, but rustic enough to allow you to embrace the Big Sky Country experience, our abode features: knotty pine paneling, aspen floors, Vermont propane stove, Tulikivi Wood Fireplace, fully equipped kitchen (sink, refrigerator, stove dishes, etc. ), spacious 15x30 great room, private bedroom (queen bed), indoor 3/4 bath and a fabulous porch overlooking Cinnabar Creek.